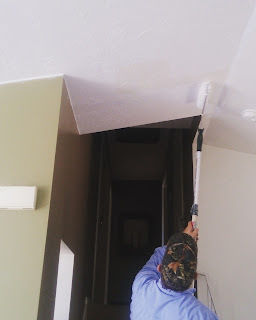 Over the weekend my dad came over and pained our ceilings. My grandpa owned a paint and wallpaper business so my dad learned the trick of the trade from him. He said the first thing to do was to paint the ceilings, so paint the ceilings we did. I cannot tell you how much of a difference it made. We kept the ceilings white but having it so bright and new has really made a difference. It opens up the rooms and makes them feel clean. The previous tenants were also not the best painters and a lot of the paint from their walls had traveled to the ceilings. It was nice to get rid of those eye sores. I don't know why but I have always enjoyed watching my dad paint. It's so fascinating and he gave us a lot of important tips this time! Here is a picture of the walls compared to the newly painted ceilings. Can you see how the walls are yellowed from age? So nice to have the ceilings so bright and clean!